As India grows more confident in her own skin, it comes as no surprise that many arts and crafts, long discarded aside as not “cool” enough, are getting a fresh lease of life. Festivals concentrating on largely indigenous forms of culture have been mushrooming, though often with good intent and not-so-great execution. 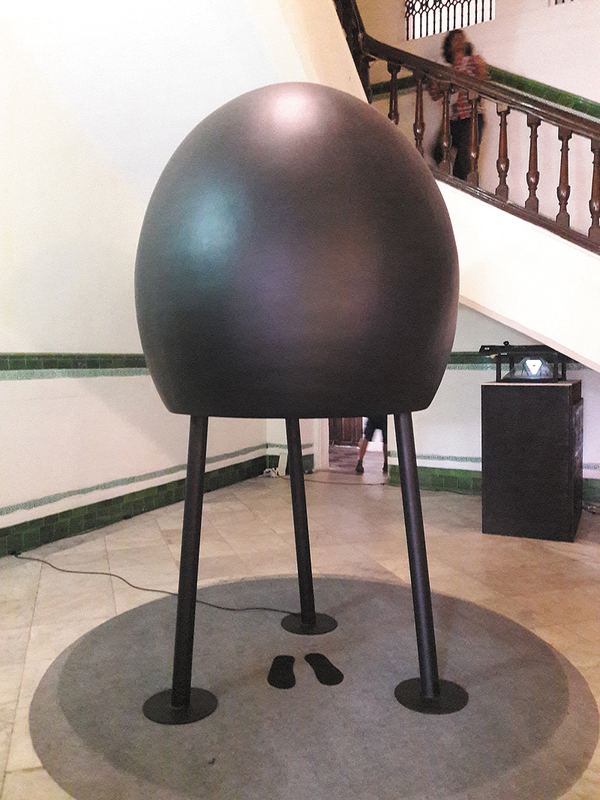 Well, the first edition of the Serendipity Arts Festival (SAF) — held in Goa between December 16-23, 2016 — has set some enviable benchmarks. Sure, when the list of what was planned came out, it impressed with its stellar cast, which included names such as Dinesh Khanna and Prashant Panjiar, Wendell Rodricks, Shubha Mudgal, Ranjit Barot, Riyas Komu and many more. Big names, however, have not always translated to a memorable experience for audiences. Fortunately, SAF not only impressed in planning, but also execution. And credit for that first can go to those with the vision and the execution. 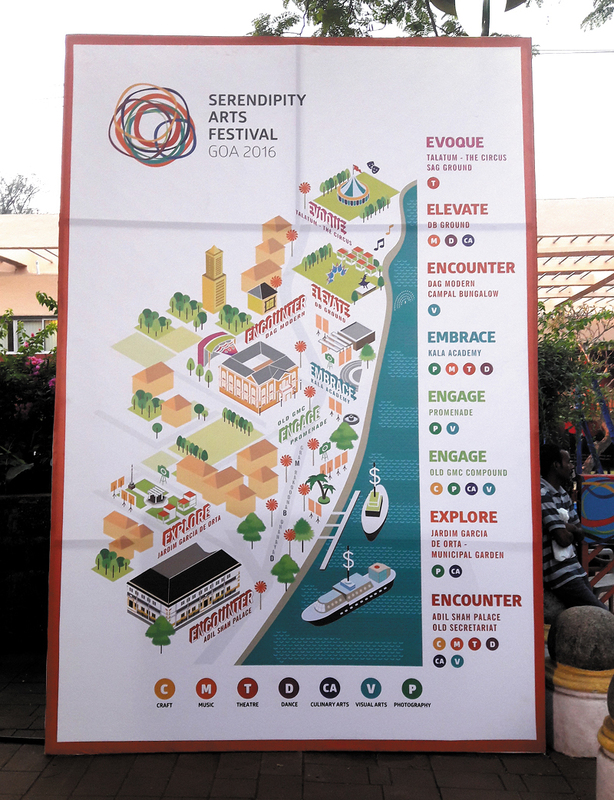 For lead patron Sunil Kant Munjal, “the Serendipity Arts Festival is a unique social responsibility project, which will promote education, spread awareness, empower artists, and reassert value in the arts”. He is eager to see the revival of some traditional arts that are disappearing, such as the circus. “We are training performers in the village in Kerala where most of them come from,” he says as an example of the kind of initiative the festival will be involved with. For festival director Preeta Singh, the eight-day-long festival is a cultural experiment that hopes to, over time, affect the way Indians interact with art on a daily basis by addressing issues such as arts education, patronage culture, interdisciplinary discourse, and accessibility of the arts. A map (top) locating the venues, which were all along the Panaji promenade, and within walking distance (mostly!). An eclectic mix of visitors streamed into Adil Shah Palace (above) to admire a matching collection of works across mediums. And indeed, right from the first moment I set eyes on the festival, it proved to be a sensory delight. For one, located by the Panaji promenade in eight venues in rather close proximity itself was a winner. I had fully intentioned to steal little strolls by the sea whenever, well, the art promised to underwhelm. Amazingly, that never happened, and my only walk on the beach came late night one day. What prevented the walks by the sea? For one, there were 53 projects, and even the most intrepid faced challenges in attending but a few. Most were engrossing enough to draw even the casual bystander in, and each took time. A case in point was the renovated Adil Shah Palace (cleaning took about a year, confided an organiser), which for me was the absolute highlight. 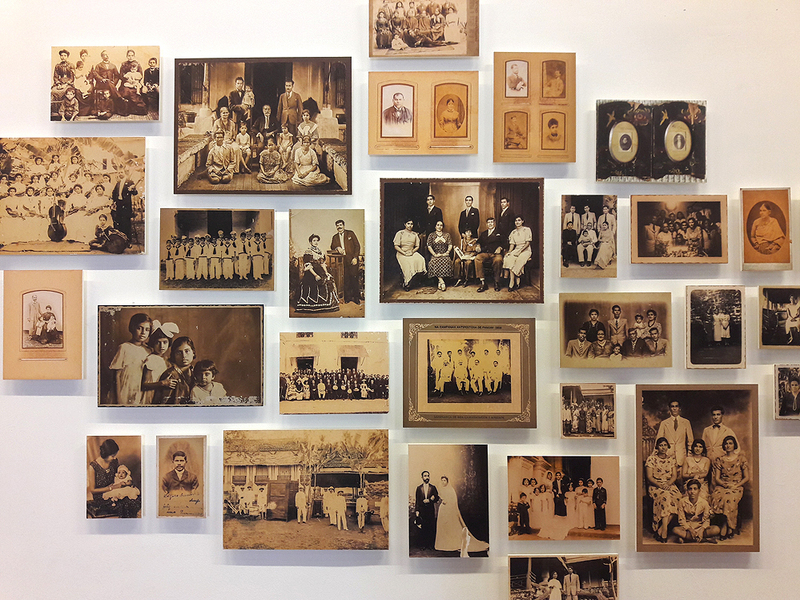 Home to the visual arts, its various halls, rooms and corridors were awash in innovative arts. Dinesh Khanna and Prashant Panjiar had curated the photo exhibits. In “Our Eyes, Our Stories,” six young “photo practitioners” from South Asia have documented the region’s complex societies, a revealing, if uncomfortable, mirror turned on ourselves. Another highlight was “The Eyes Have It”, where nine writers described in their own words what a separate set of photographers had shot. It was like reading stories via visuals. Of course, art wasn’t on the wall always. A workman carrying logs that I nonchalantly passed later turned out to be a performance artist, one of the seven, whose live displays aroused a lot of curiosity. 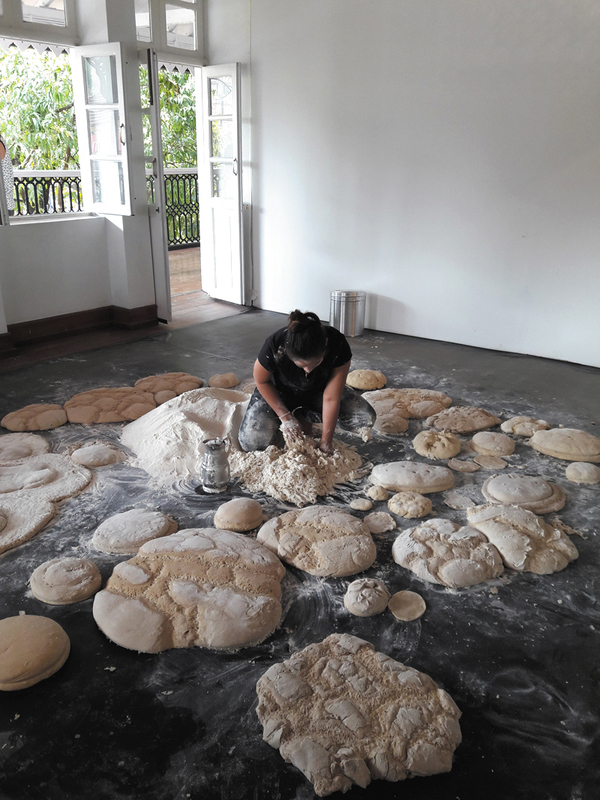 Another was kneading a roomful of dough, while another took his shirt off. Skin show wasn’t taboo, and the section was called Lucid Sleep! 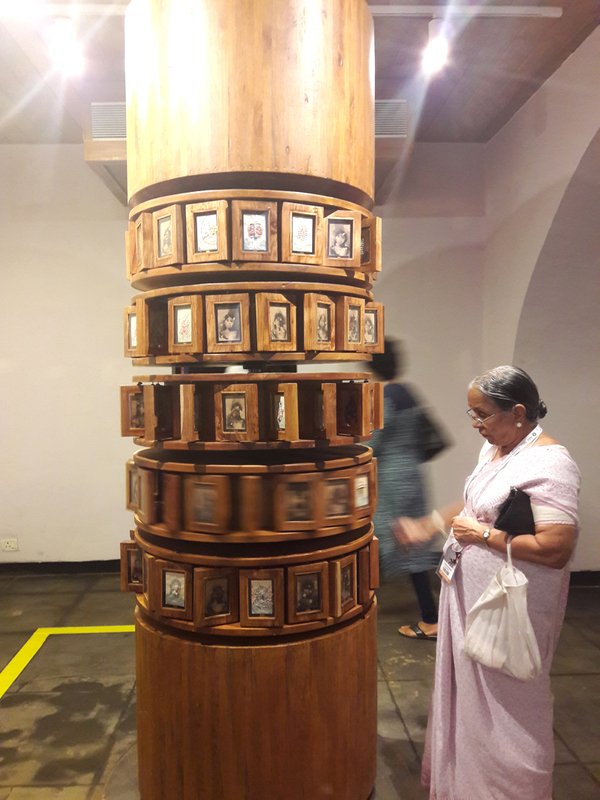 Goa had a big part in the festival, and exhibits ranged from Prabuddha Dasgupta’s pictures of Catholic Goa, hitherto unseen in the state, to an exhibit titled “The Way We Were”, which had early 20th century photographs of Goa — and it seemed to be visually an almost magical place. Wendell Rodricks looked at Goan costumes through ten objects, from a mother goddess image to a Narkasur effigy and Zottim sandals. Yep, the controversy was over captions to these exhibits! 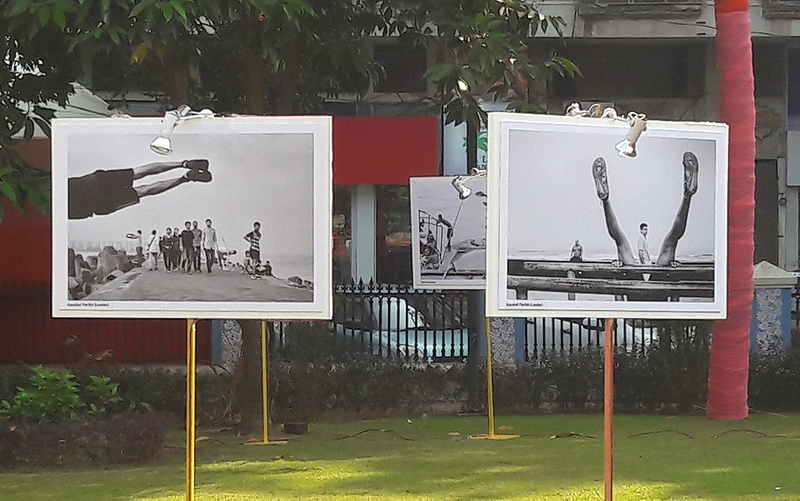 At Jardim Garcia d’Orta, a historic park in heart of old Panaji, an exhibition of street photography from photographers and collectives around the country, explored the idea of “serendipity”. Insightful, they turned the gaze to a Goa often unseen, that of garages and lifeguards, of decrepit buildings crying out for renovation and parked idols, local wrestlers and uniquely Goan wall hues. And much more. Performing arts are where the human volumes are, and this fest was no exception. The section curated by Shubha Mudgal, Living Traditions, included highly appreciated performances by Kaushiki Chakraborty and others, in a set that was itself a recreation from an earlier era. Even the performers were attired in recreations of attire copied from photographs of the era by designer Rohit Bal. Ranjit Barot has a legion of fans, and no surprises then that DB (Bandokar Grounds to the uninitiated) was the gathering point for festival attendees each evening. Yes, it was a surfeit of sensory pleasures, stimulating, and it only left me, and many other attendees, wishing the era of clones was upon us so that we could attend programmes simultaneously. Early 20th century Goa seen through the lens of Souza & Paul, which opened shop in 1884, and is still located at the same spot. Arguably one of the biggest and unexpected successes was at the old GMC building, where art and science met. Melodiously, harmoniously, and arousing a great deal of curiosity, not just among the young, but also young at heart. The section, called Entanglement, showcased a number of fascinating projects. If the Earth Pod allowed you to hear different sounds of the planet without any human cacophony, the Think Tank, in layman’s terms, turned thoughts to raindrops and memory to a tank of water. Yes, eager beavers stood inside a transparent fibre enclosure under an umbrella, and made rain happen! While it was easily amongst the most queued for, there were also many other projects that so ceaselessly bridged aesthetics and science. Oh, there was lots more. A river cruise with vocalists. Multiple food venues. A range of workshops. Art on display. Food stalls. Food workshops. Wine workshops — with wine flowing of course. Feni workshops! A booth of food stimulation, which was best avoided on a hungry stomach. It stimulated, but offered no grub! What was perhaps most laudatory was the spirit of inclusiveness. And in remarkable ways. 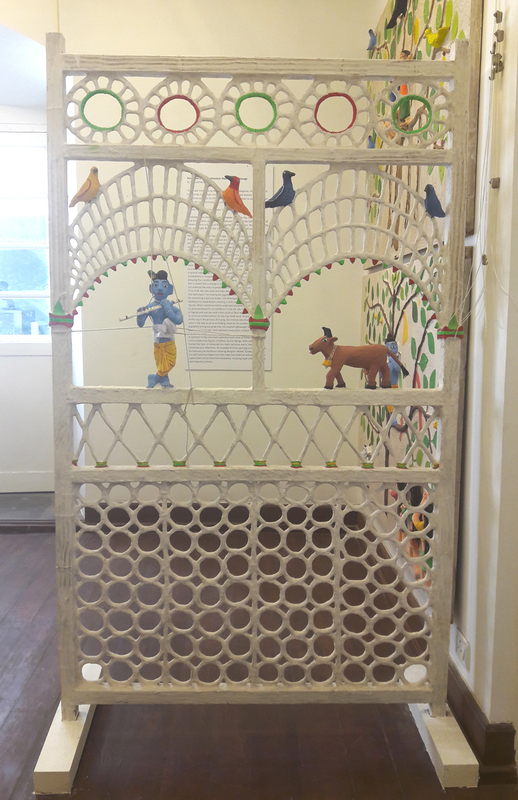 Not only did Adil Shah Palace have tactile models, which helped the blind understand better how to negotiate the palace, there were also works that were meant to be touched and felt, a laudable step indeed. And curated walks, workshops and games for the differently abled. In the more usual way, the gaps between the artists and the audiences were often minimal, helping in more satisfactory interactions. Artists getting accosted, queried, and hopefully appreciated, is arguably a hallmark of the good cultural fest, and in this regard, the festival scored well too. The Earth Pod. By standing within it, you could hear different sounds the planet makes, outside of human existence. The choice of location, Goa, is perhaps inspired. Already a magnet for holidayers in the season, the festival is another addition to an already rich local seasonal calendar. Incidentally, even as the Goa government has driven out the popular EDM fests from the state, SAF perhaps comes with a more “pliable” audience. Information about the festival, not just through printed brochures, but also an exhaustive site and app, helped audiences negotiate on their own. The lack of structured interactions, however, left some disgruntled. A lot of the collections are worthy enough to merit a more permanent space. SAF does plan to have extension exhibitions, Munjal revealed, and one hopes these works will be more widely seen. One can only look forward eagerly to see what learning is drawn from this edition of the festival, for an even more satiating one next December. With a separate beach day planned!